About 70% of Earth’s surface is covered in water. God made humans to live on land. He made fish to live in water. Amphibians do a bit of both. What if, some scientists and designers wondered, humans could don gills and draw oxygen from water? Jun Kamei is a material scientist graduate of London’s Royal College of Art, a research university for art and design students. 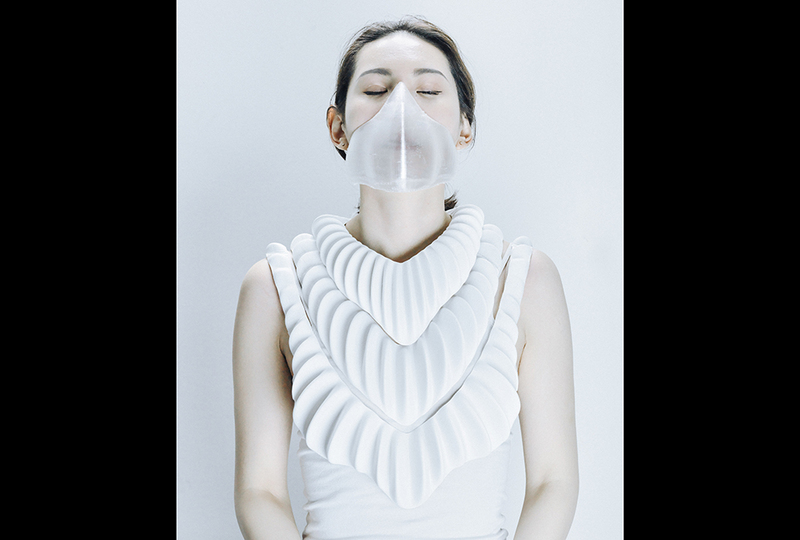 Kamei combined his interests in science and fashion for the creation he calls Amphibio. Amphibio is a grooved, wearable, collar-type apparatus. It comes with an essential respiratory mask as part of the complete ensemble. Both pieces are created using a 3-D printer. The collar operates as a gill. It can extract oxygen from water and deliver it to the wearer through the mask. Though the prototype does not produce enough oxygen to sustain a human under water, Kamei believes he’s on the right track. Eventually, he thinks technology will catch up to allow humans to explore the deeps without the burden of an oxygen tank. 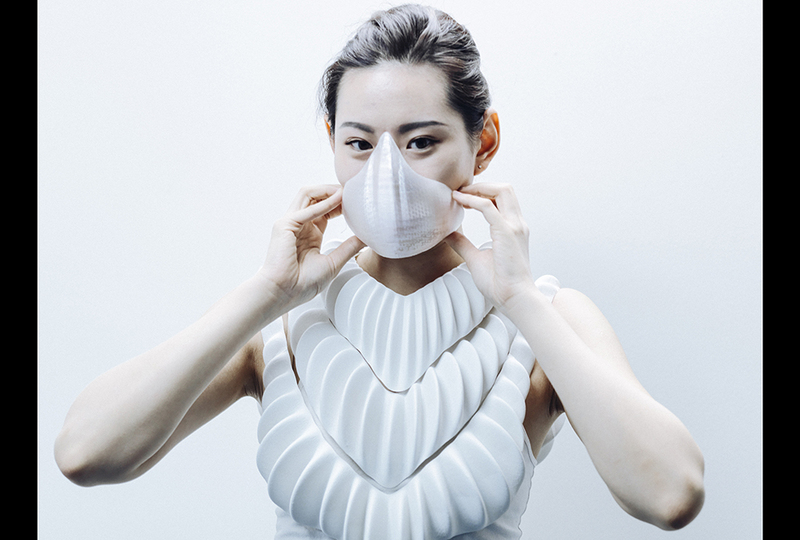 Kamei created Amphibio from a water-resistant material. Microscopic pores let oxygen and carbon dioxide gases pass through it. The gill system is hollow, providing a reservoir for the oxygen extracted from water. According to Kamei’s website, the design was inspired by water-diving insects. These creatures hold a small amount of oxygen around their exoskeletons when they submerge. They use that oxygen while under water. Amphibio holds a small reserve of oxygen inside. The gill replenishes it as it is used up. But Amphibio’s volume is just a drop in the bucket for the amount of oxygen actually needed. 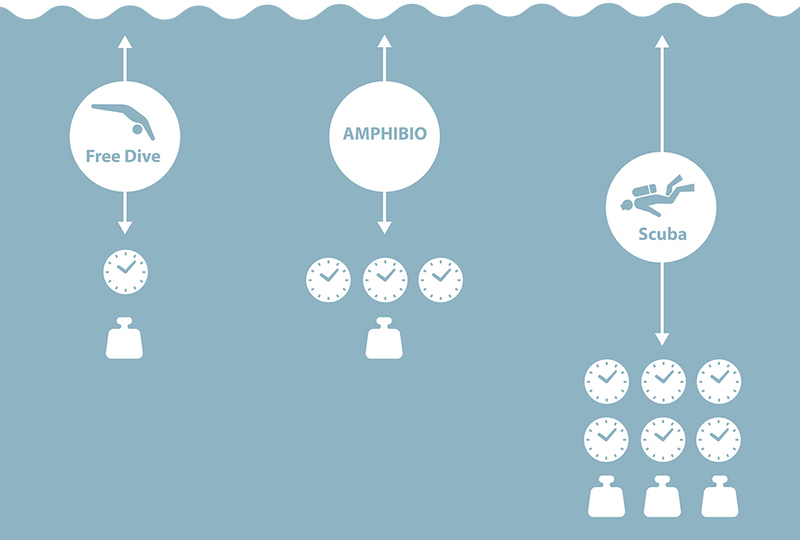 Amphibio’s creator dreams of its further development. His next goal is to create a gill garment with an adequate oxygen capacity for a person. Then Kamei plans to test it with human divers. But is he in over his head? With current technology, that garment would need to be at least 32 square meters to provide enough breathable oxygen for a person underwater. That’s about 344 square feet of molded fabric the human would need to wear—something the size of a large living room. The visual makes an oxygen tank seem a lot less cumbersome—maybe even downright practical! It’s normal to be skeptical about far-fetched ideas. But even so, don’t automatically pour cold water on someone’s brainstorms. Most inventions begin with an idea that seemed unlikely at some point. God gave people tremendous creativity and the perseverance to try, fail, and try again. That’s how progress happens! Looks like something from Harry Potter! This is a very interesting article to read about but the inventor (Jun Kamei) could think that it is complete and have somebody (maybe even himself) try it and it fails what then? l mean it would be really cool if it actually worked but just be careful. I would not want to be the first user! Cool! It seems kind of dangerous right now, but in the future, this could be reality! Just think of all the artifacts we could find!I hope it works! so cool and pretty. I think it will work. just imagine: diving into the ocean and you don't need to hold your breath! cool! I want one if they come out! It would be so cool if they could make in minecraft theme. Then you could make underwater glass cities in real life! Also it could be dangerous if it sprang a leak. this could be dangerous, and also useful, I do not think it should be invented. Why?Because God made us without gills. If he wanted us to have gills, He would have made us with them. I think staying with oxygen tanks is a good idea. Anybody see the news about Stan Lee? Well, to say that just because God didn't give us gills means we shouldn't make them, isn't necessarily true. By the same aspect, we shouldn't have ever gone to space, or created airplanes. In cases of doubt, we should look towards the Bible for guidance. I cannot think of, or find any verse that goes against this idea, while Genesis 1:28 almost seems to support it. Also, what difference is there between this, and oxygen tanks? They both allow people to explore underwater, and stay underwater for a much larger amount of time than any human alone could achieve. Besides bulk, and actual methods of supplying oxygen to the user, they are effectively the same, right? That would be so freaky to be underwater breathing! I am interested about how it could influence underwater discovery! It sounds to me like it will still need a lot of work and need to make the gill garment smaller. If we could get it to work this would be my dream! but at this rate its really only a idea. if it does happen I might be long dead before it is finished. i hope it works though, it seems like something from a dream or movie! That looks really cool but I'm not sure if I would be up to it if they haven't figured out everything yet. Even once they test it, I feel like I would be too nervous to do it for a while. THAT is SOOOO cool just think back to the 1900's they would have thought this impossible same with flying, this article just shows how far humanity has gone from Adam all the way to breathing UNDERWATER!! This could be cool, but also really dangerous if something goes wrong! I'm kinda on the "NO" side, but I see how it could be cool. Just not my thing! Anyways, Harry Potter already has his gillyweed! That would be really cool. People could explore under water for longer and maybe even live under there in time. that would be so cool to be able to swim for as long as you like. You could also experience what it is like as a fish. That's so cool! 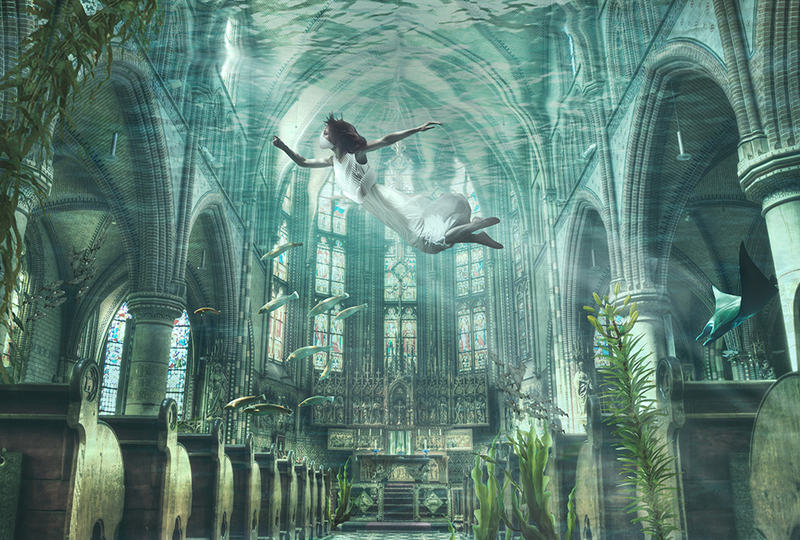 I'd love to be able to breathe underwater. Hahaha everyone is saying it is "Cool"
Thats a little scary, and cool! We didn't enter the world with clothes on, did we? God wants us to explore what He made. But we should let him guide us. But I do think it will be a little while before that becomes reality. so kewl. if only they did that at school! "wink, wink". It seems like everyone who has a good idea is made fun of. I bet if Kamei keeps working on it, he will figure it out! And i think God made us without gills so we could have fun inventing lost of things! I mean, he purposely gave us an imagination, right? it would be really cool to be "mermaids/mermen"
This would be so sick if he can get this done. Am I right? This is really interesting, but they need to decrease the size needed for oxygen. That is awesome! Although if it does come out in stores and it really works it will probably cost a million dollars! I can see underwater without goggles! I just open my eyes. It's a little bit blurry, but I can see good enough to not smack into something. ;) My eyes do get red and sting kind-of-a-tiny-bit, but that's because of the chlorine, I think. Wow! this is the 48th comment! I would like these to work because I love swimming, but I don't like using a snorkel and I can't hold my breath for very long. Same. I hate snorkels, and the longest that I've ever held my breath is about 11-13 seconds.